Global Com finds many ways to give back to our community. 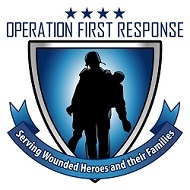 We are proud supporters of Operation First Response (OFR). The mission of Operation First Response, Inc (OFR) is to serve all branches of our nation’s Wounded Heroes/Disabled Veterans and their families with personal and financial needs. Services are provided from the onset of injuries or illness, throughout their recovery period and along their journey from military life to the civilian world. This is our opportunity to put words into action when we say that we “Support our Troops”. Global Com is proud to sponsor Adil Bhatti, a highly talented member of the US National Cricket Team in the ICC World Cricket League Division Three. We wish Adil and the US Team huge success for this season. For more information about the US National Cricket Team, please visit their website: here. “Northern Virginia Family Service cannot thank you enough for your continued partnership. Your recent donation of time and materials has made a tremendous difference for the families we serve at our SERVE campus in Manassas.